New day, new week, new baked donut recipe for you! 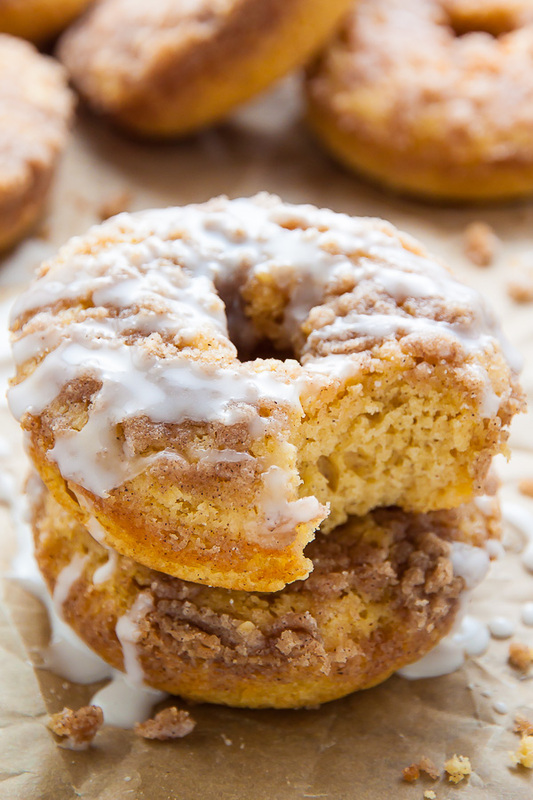 Today we’re talking coffee cake donuts with vanilla glaze. 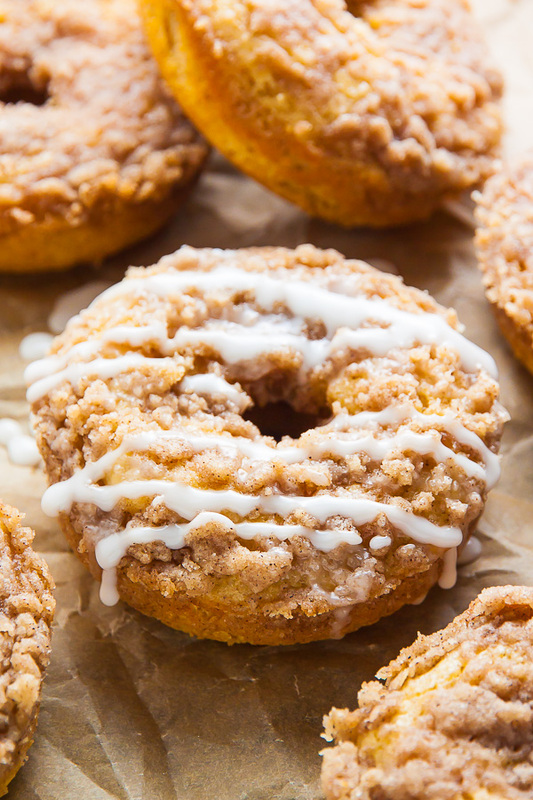 This vanilla cake donut recipe is supremely moist, loaded with buttery crumbs, and finished off with a sweet vanilla glaze! The best part? They bake up in just 10 minutes!!! 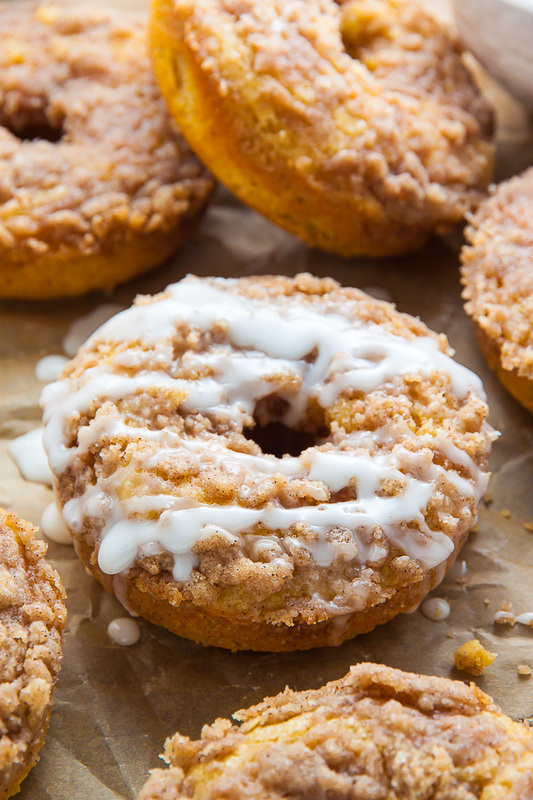 There are 3 parts to this recipe: the crumb topping, the baked donut base, and the vanilla glaze. As I mentioned earlier, these donuts are baked, so you will need a donut pan for this recipe. If you don’t own one already, click here to check out the one I’ve been using for years. You’ll want to make the crumb topping first so it has time to chill in the freezer. For the crumb topping you’ll need cold unsalted butter, granulated sugar, all-purpose flour, and cinnamon. You cut the butter into small cubes, then quickly work it into the remaining ingredients until the mixture resembles a course meal. Then pop the bowl in the freezer while you make your donut batter. Chilling the crumbs in the freezer helps them melt more slowly during the baking process. To make the donut batter you’ll need all-purpose flour, light brown sugar, a pinch of salt, baking powder, sour cream, unsalted butter, and an egg. You’ll combine the wet ingredients first, then gently whisk in the dry ones. Super easy! You’ll want to make sure your donut pan is generously greased before evenly dividing the donut batter among the molds. You can do this with a spoon, or you can transfer the batter into a ziplock bag, snip off one end, and pipe the batter into the molds. 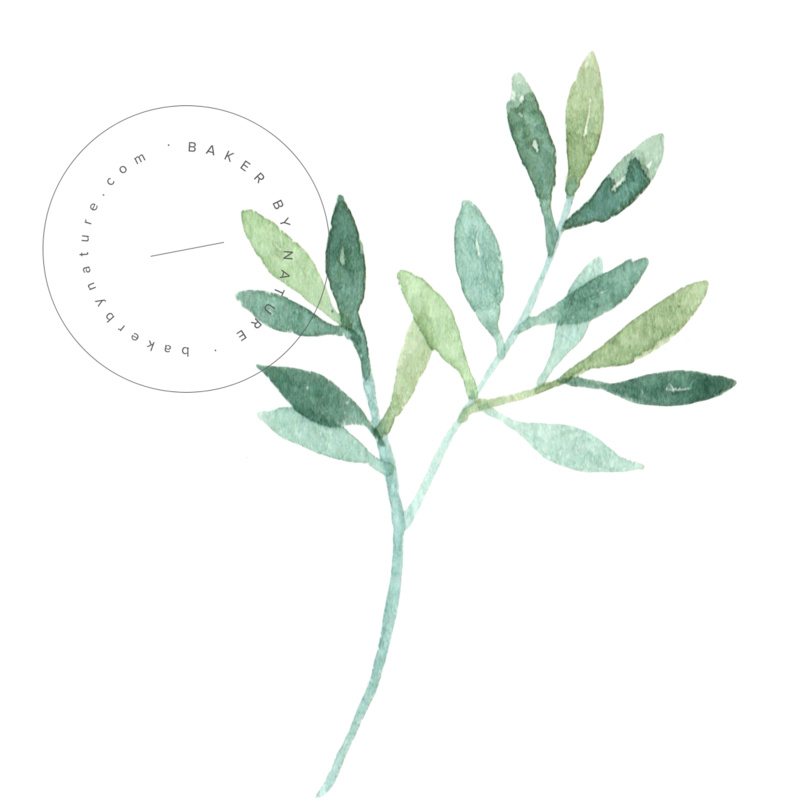 For a visual on this, click here. The donuts only need to bake for 10-11 minutes, so be sure you keep an eye on them. When you remove the donuts from the oven, you may notice some of the crumb topping has baked over the “hole” area – don’t fret! This is normal and will probably happen. Simply use a skewer or toothpick to clean it up. Then you’re going to let the donuts cool in the pan for 10 FULL minutes before gently lifting them out and onto a cooling rack. While the donuts cool, you can make your glaze. The glaze is seriously the easiest part! Simply combine confectioners’ sugar with a little milk and vanilla, whisk smooth , and viola – you’re ready to drizzle! If you’re not serving the donuts right away, I suggest holding off on the glaze, as they do get soggy after a while. 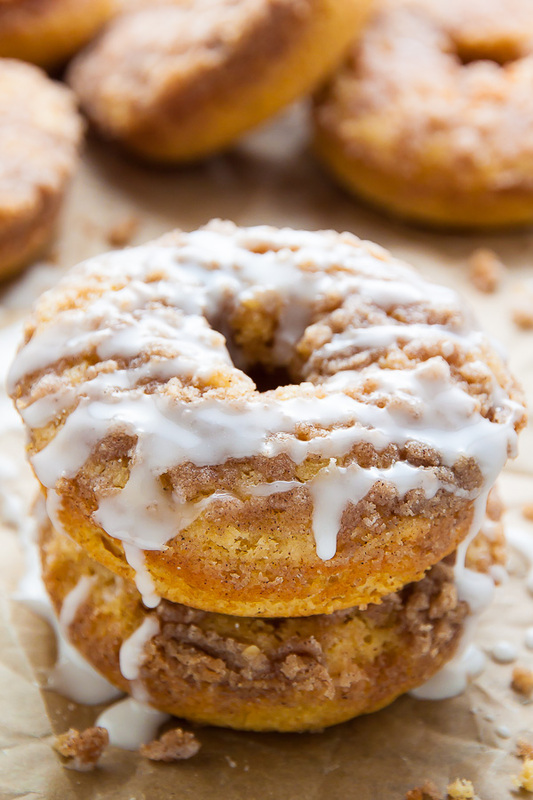 Coffee Cake Donuts topped with Vanilla Glaze! Ready in less than 30 minutes. In a small bowl combine the sugar, the flour, and cinnamon. Add in the butter cubes and quickly work them into the mixture until it resembles a coarse meal; chill the topping in the freezer while making the donut batter. In a large bowl whisk together the dry ingredients. In a separate bowl whisk together the wet ingredients. Gently fold the wet mixture into the dry mixture - don't over mix! Spoon or pipe the batter into the prepared doughnut pan. Divide crumb topping evenly among donut tops, then bake for 10-11 minutes, or until the doughnuts spring back when lightly pressed. Allow doughnuts to cool for 10 minutes in the pan before gently lifting them out and transferring to a wire wrack to cool for a few more minutes. In a small bowl whisk together the confectioners' sugar, milk, and vanilla. Drizzle over donuts and serve at once. Wow these look delicious! Great flavours. Thanks for sharing. Ah! My two favorite breakfast foods in one beautiful creature. I can’t wait to whip these up! You’ve done it again!! The perfect breakfast treat! I bought a donut pan last winter and I can’t wait to try this recipe! Thank you for sharing, they look irresistible! Yay! My donut pan is seriously one of the best “investments” I’ve ever made 😉 Enjoy!!! These look totally amazing. Printed recipe. Got to try this one. 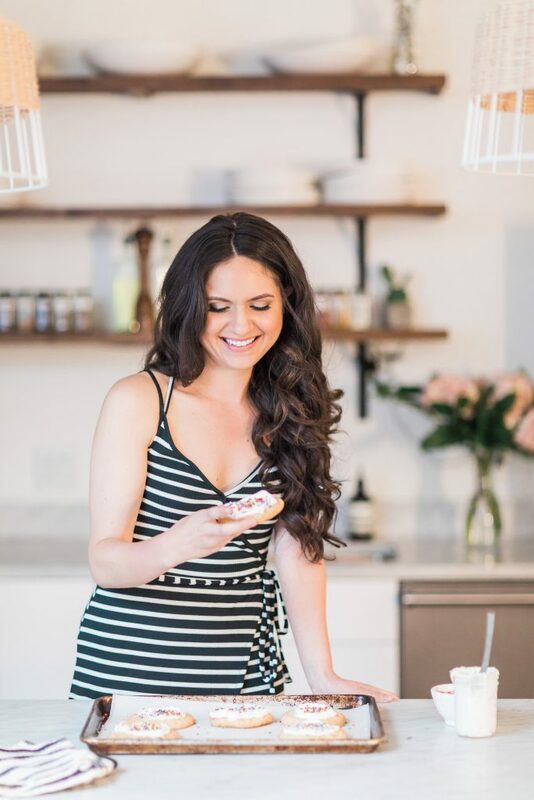 Can you use fat free sour cream? Your recipe mentions full fat sour cream. Hi Robin. I do recommend using full-fat sour cream for this recipe. While fat-free may work, the texture and taste will be a little different. If you have full fat yogurt you can use that. Looks so yummy! 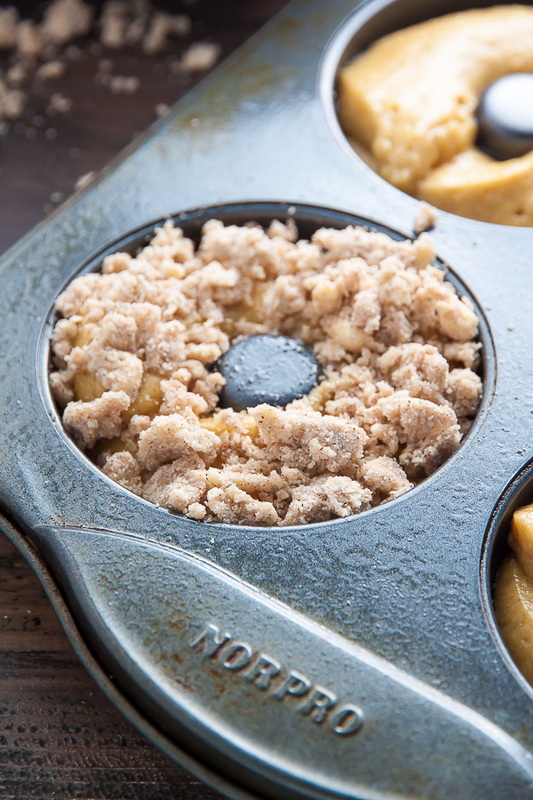 Would a regular muffin pan work the same as a donut pan? Maybe bake a few min longer? Hi Sherri. I don’t think a muffin pan would work the same, but it may still work. 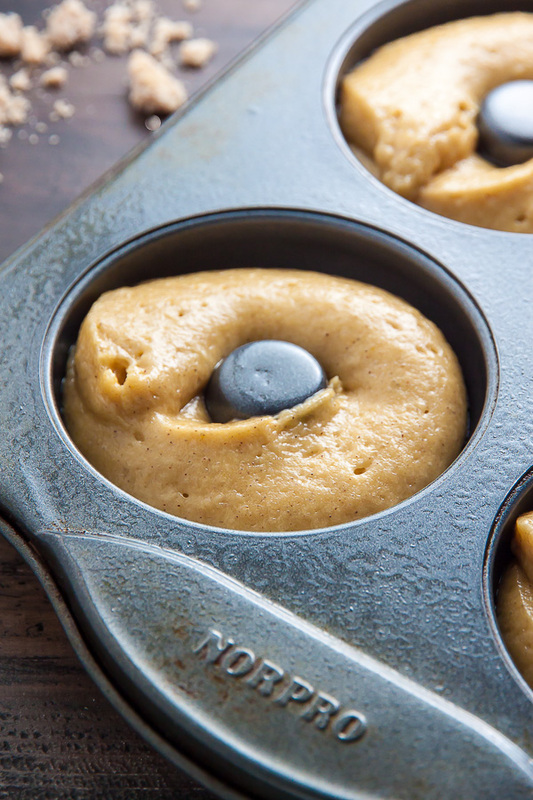 You may only have enough batter for 8 muffins, and I would definitely keep an eye on them as they bake, taking them out of the oven once they’re golden brown and the centers have set. If you give it a go, I’d love to hear how it turns out! Just made these! Doubled because 6 donuts are NEVER enough!! Amazing! Thanks for the yummy recipe!!! These look amazing! Although the title of recipe says “coffe cake donuts” but there’s no coffee ingredient? Like espresso powder? 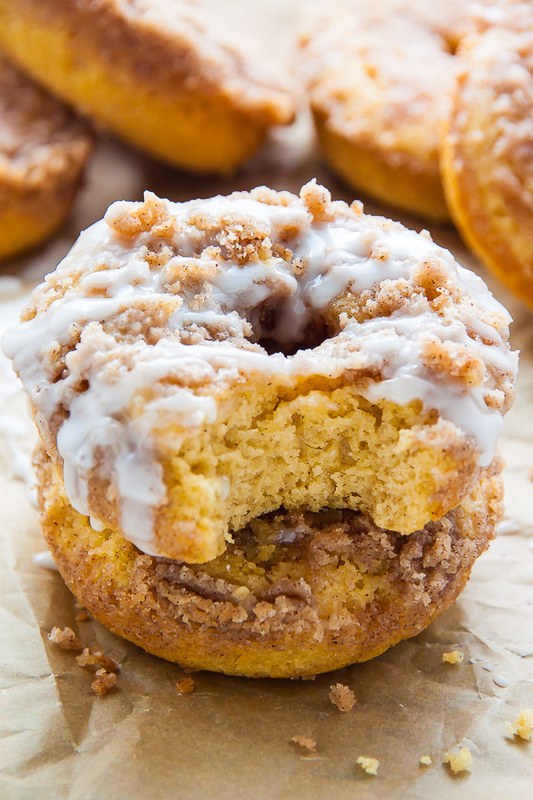 This is just amazing, thanks for sharing this awesome Coffee Cake Donuts, my kids will love these !! Is there any way to make it in another pan besides a donut one? Unfortunately they must be made in a donut pan. So I made them and the batter was so dry it wouldn’t mix so I added a splash of milk and they didn’t turn out well:/ is the batter supposed to be so dry it’s hard to mix? MY hubby loves coffee cake and donuts so the perfect combo but mine didn’t come together right. Then the crumble on top just melted. Is it white sugar for the crumble and brown for the batter? In regular coffee cake it’s reversed. Help me!!! We had the same issue. The ingredients combined into a thick paste. No way were they going to fit in a piping bag. The recipe says not to overmix, but it took so much mixing just to make it blend together. Feels like it is missing a wet ingredient. I had that problem too. It doesnt come out as a thick batter. It is a dough! I can’t even spoon it. Not sure what the problem is. I made the coffee cake doughnunts today! They were scrumptious! I have to say i like this recipe better than all of the coffee cake recipes I’ve used in the past 🙂 sadly I didn’t have a donut pan but my cupcake pan worked good. I had to increase the cooking time a bit but they were perfect! Thank you so much for the recipe! SO happy to hear they were a hit, Stacy!!! WHAT WOULD BE THE BAKING TIME FOR MINNIE DONUTS? Coffee doughnuts but no coffee in the recipe. Am i missing something? Coffee cake is the best! Can’t wait to try these! Thanks for sharing! Made these today and they exceeded my expectations! Sooo moist and just melt in your mouth! Thanks for another amazing recipe! I ended up making them with light sour cream because it is what I had and they still taste great! Hi! It’s almost fall, can I add pumpkin puree to make it that flavor? What would be your suggestion? These were fabulous! I only have unsweetened vanilla almond milk on hand so that’s the milk I used. I also didn’t have sour cream so I used full fat Greek yogurt instead. Worked great….. although I had to use a little more almond milk because the batter was way too thick. We will definitely make these again. Thanks! I made these gluten free with Bobs 1-1 flour and used Daiya dairy free vanilla Greek yogurt in place of sour cream. They tasted so delicious . This recipe is absolutely the best! I had all the ingredients on hand and made it exactly as instructed. This is my families new favorite! All other donut recipes I’ve made since are compared to this one and always fall short. My wife just requsted that I make these again tonight. Thank you for sharing this recipe! This comment just made my day! Thank you 🙂 And Happy Baking! I made these tonight. I wasn’t expecting the batter to be so dense, but I’d never made donuts before so I carried on. They are good. I had to almost double the baking time however I do live at high elevation so perhaps that was the problem there. I skipped the glaze as a matter of personal taste, I simply don’t like it. Hubby loved them, this recipe is a keeper although I think I’ll have to tweak to compensate for Mountain life. These look so moist and totally delicious. Pinned. Fantastic recipe. Thanks for sharing. Hi, what is a “stick” of butter? I googled it but a stick seems to very in weight. A stick of butter is 4 ounces or 1/2 cup. I made these this morning and my husband and kids said they were the best baked donuts I’ve ever made! Thank you for sharing this recipe! This recipe was the first donut recipe I made with my new mini donut baking tray! They are so tasty I may never make a different recipe of donuts ever again!! Low-fat sour cream does work just as well, I have found. Thank you for this delicious recipe! Perfect recipe! Will use again! I made these today. Very tasty but took almost 20 minutes to cook. I looked at the photos on the recipe here and it looks like there is some type of spice in the batter, but it’s not listed on the recipe. Are there any spices in the batter? These are delicious!! Best baked donuts I have made. 10 minutes cooking was perfect. I added a grating of nutmeg to the batter.